The Bowman Creek Educational Ecosystem (BCe2) has been awarded by the Indiana Department of Education for Excellence in the Postsecondary Partnership category. Leaders of the program were honored at a ceremony in Indianapolis on Thursday, February 8. The program’s humble beginning started in 2012 with a cleanup of Bowman Creek in the city’s southeast neighborhood. 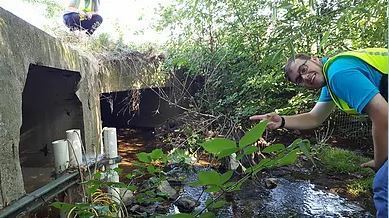 A City of South Bend supplemental environmental investigative report found it was the most impaired tributary in the St. Joseph River and uninhabitable to marine life. However, faculty and students from the University of Notre Dame Center for Social Concerns (NDCSC) and College of Engineering (NDCOE) knew there was more to this than just the creek. The Southeast neighborhood had been a bustling site for employees of the Studebaker factory, but after closing its doors in 1963, the population dramatically declined. 55 years later, only 2,500 of the original 10,000 residents remain. The revival of downtown made it an appropriate time to capitalize on the resurgence in the area. Without hesitation, NDCSC and NDCOE got started, capitalizing on their students’ infectious energy. Faculty and students from local colleges and high schools brought their talent to BCe2 starting with the creek cleanup. 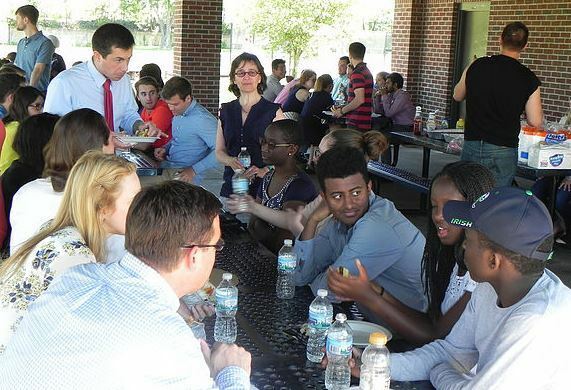 Engineering students from the University of Notre Dame worked alongside students from Riley High School, home to the technology and engineering magnet program. Students from NDCOE also designed a pedestrian bridge and students with NDCSC surveyed the neighborhood on issues residents wanted to see addressed. By 2015, several interns from across the city started working with the program. As cleanup efforts expanded, community partnerships began to grow. 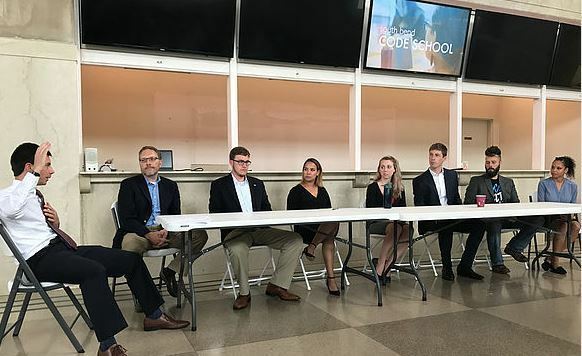 Representatives from Ivy Tech Community College, Indiana University South Bend, St. Joseph High School, and more started to lend their expertise. There was a clear need to address neighborhood problems beyond the creek, but it was imperative that participants include the community on prospective projects. Boukdad says collaborating with grassroots neighborhood organizations, the City of South Bend, and residents of the Southeast neighborhood was key to growing the program. The main challenge has been gaining the trust of neighborhood residents who have been wary of the program’s longevity. Helping to ease the transition is Southeast Neighborhood Resident and Ivy Tech Community College Student Fred Teague. Teague serves as a liaison to two other neighborhood organizations, 466 Works, and SOAR, or Southeast Organized Area of Residents. “The main thing is being an active, consistent presence in the neighborhood,” Teague says. To fulfill this mission, BCe2 continued to host barbeques with SOAR in local parks to increase visibility and communication between the organizations and neighbors.The picnics provide an opportunity to dialogue on ways to address challenges in the neighborhood and include residents in the decision-making process. BCe2 stepped in to help advertise and promote the events. By the end of the summer of 2017, over 300 people came to the SOAR picnic to celebrate, meet their neighbors, and break bread together. In addition to these gatherings, Teague says BCe2 members canvassed the neighborhood and surveyed residents on the most pressing issues preventing the area from prospering. “We walked block by block and took a survey determining that poor lighting was a main issue,” he says. BCe2 worked with the City of South Bend and homeowners to implement and publicize a City of South Bend pilot program for lighting. Homeowners paid for a portion of the installation and connected the lamp posts to their electrical system while the city paid the remainder. The program provided an affordable way to combat late-night crime while beautifying the area. In April, 30 new lamp posts will be installed. BCe2 has evolved to include several other pilot programs, including the Vacant Lot Optimization Team. After Mayor Pete Buttigieg’s 1,000 Homes in 1,000 Days program ended, there were roughly 400 vacant lots on the southeast side. The team mapped out their locations and collected data to determine the best use for each space. St. Joseph High School Student Marty Kennedy was one of the interns involved with the project. 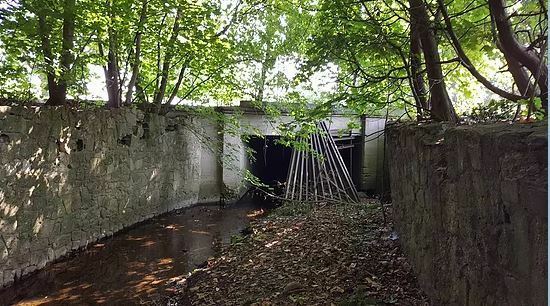 “We would go to these lots and observe the best kind of use for each one, whether that is splitting the lots between two neighbors to increase property value or installing residential housing or building a rain garden,” says Kennedy. The team presented their information to city officials who gave them the green light to use the lots as a way to find creative solutions to local problems. From the data, they found one of the most prevalent issues was basement flooding from excess rainwater. “We are trying to reduce the human health effects of combined rainwater with sewage backup in a person’s basement,” says Gary Gilot, director of engineering leadership and community engagement at NSCOE. BCe2 came up with the environmentally-conscious and cost-effective solution of implementing rain gardens filled with native plants. The roots would expand several feet into the ground, soaking up excess rainwater at a quicker rate. 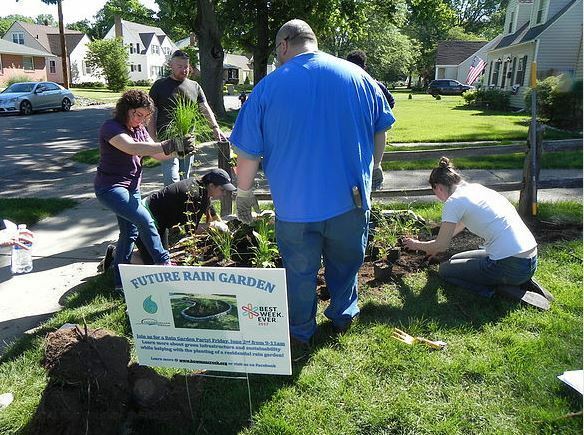 By incorporating several gardens near homes and vacant lots they can prevent excess water from flooding the sewer systems and basements. 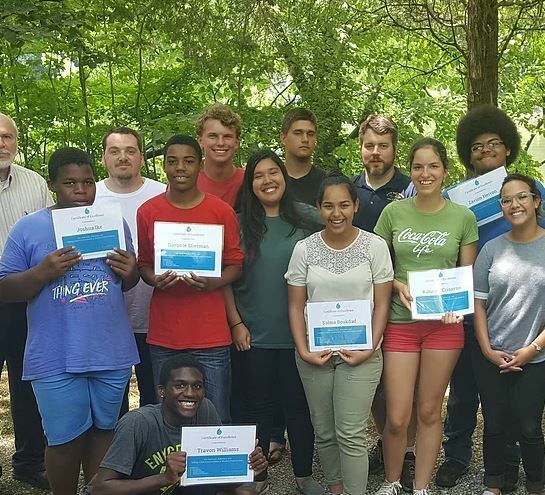 The project has also allowed high school students to get involved with BCe2 through Bowman Creek Academy, a week-long summer program focusing on environmental sustainability and youth empowerment. Kennedy helped establish the program in 2017. “We created a rain garden at Ivy Tech which was awesome because it allowed the students to take what they learned and apply it to a tangible project,” he says. Participants also visited local tree nurseries, learned how to incorporate technology into the projects, and had the chance to look at the smart sewer infrastructure in South Bend. The University of Notre Dame is also capitalizing on the educational impact of BCe2. The site has become the inspiration for a new engineering course. “The Bowman Creek Internship was gaining momentum and we wanted to start thinking about how we could integrate it into the general curriculum,” says Notre Dame Graduate Student Maria Krug. She now teaches the undergraduate Community-Based Engineering Design Projects course through NDCOE. In it, students learn how to combine their engineering expertise with a human-centered design. BCe2 has also led to a collaboration with Indiana University South Bend. The two were awarded a grant by the National Science Foundation (NSF) to improve undergraduate STEM education (IUSE). As part of the grant, faculty from NDCSC, NDCOE, and Notre Dame Anthropology faculty led a team of ethnographers from regional schools to analyze the BCe2 program. Throughout the summer they collected data on the relationships between the interns, mentors, and the community. Gabrielle Robinson, a South Bend native and graduate of Indiana University South Bend, spent the summer working with the ethnography team. She says it was rewarding to see the students evolve from the start of their internship to the end. Even more rewarding is how invested they became in the community afterward. “They embrace the challenge of going into this area that is seen as a conflict-ridden place and they give it something to be proud of,” says Robinson. As BCe2 continues to gain close alliances with residents, community organizations, and the city, they are also subconsciously cleaning up the tarnished reputation South Bend has been trying to rid itself of. Gilot says South Bend has involuntarily become net exporters of talent. Now, the city has opened its doors to technology, sustainability, and creativity, leading to job growth. The missing element is making students feel personally connected to the area. “If we can get their hearts a little more connected to community-engaged work it makes a lot of difference in whether the talent wants to stay,” he says. Krug has seen the results for herself. Kennedy says he has also witnessed a renewed pride in his hometown. “A lot of the rhetoric I was hearing a few years ago was, South Bend is terrible, it is boring and there is nothing here,” he says. “As we have tried to do more things to improve the city and make it better, more people say they love South Bend and want to stay here." The reach of BCe2 is an impressive feat that has brought together people from all walks of life who may not have interacted otherwise. “To see students from all over the world at different universities come together for a united cause and actually see results is amazing,” Teague says. Krug says the diversity of these collaborations has also enhanced in-classroom learning. Students are now beginning to leave the university bubble and see what is out there. “That immersive experience for the students is the most important aspect. On a regular basis they are able to go to Ivy Tech and Indiana University South Bend and the city,” she says. 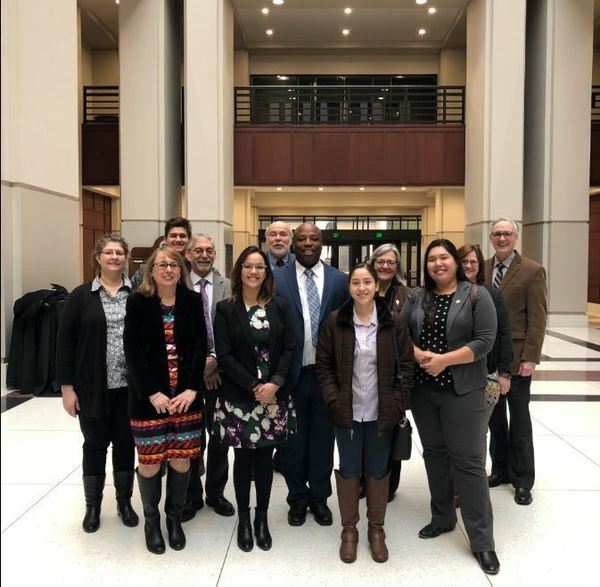 Earning an award that recognizes the importance of these partnerships from the Indiana Department of Education is validation that the group’s hard work is paying off. “We are very excited about our program but for someone else to acknowledge that, it is something we have been striving towards as long as we’ve been around,” says Boukdad. As BCe2 looks to the future, they will continue their existing programs and hope to expand their involvement in lead risk management, affordable housing, and community development spaces. The BCe2 model may also soon be replicated on South Bend’s west side. Of course, the focus will stay the same -finding sustainable solutions to real-world challenges and in so doing, empower residents. To learn more about the Bowman Creek Educational Ecosystem, community partners, or to get involved, visit bce2.org. Originally published by Allison Preston at conductorshare.nd.edu on February 20, 2018.